The granulitized eclogites from the Luliangshan terrane of the North Qaidam UHP metamorphic belt occur as lenses within pelitic gneisses and orthogneisses. Combined petrologic data and phase equilibrium modeling indicate a multi-stage metamorphic history of the granulitized eclogites: (1) an earlier eclogite facies metamorphism (P>18.5 kbar, T> 830 °C) is deduced from omphacite relics in the matrix and rare omphacite inclusions within garnet. The possible assemblage is garnet+omphacite+rutile+ quartz; (2) the early stage of high pressure granulite facies assemblages (garnet+clinopyroxene+ plagioclase+rutile+quartz+liquid) developed in the early decompression process has a P-T regime of 17.5 kbar and 852–858 °C, constrained by plagioclase and clinopyroxene inclusions in garnet. The late stage of high pressure granulite assemblages (garnet+clinopyroxene+amphibole+plagioclase+rutile+quartz+liquid) records an isothermal decompression process with the pressure successively declining from 17.5 to 14.7 kbar and to 11.3 kbar at 858 °C; (3) the later medium pressure granulite facies assemblage (garnet+ orthopyroxene+clinopyroxene+amphibole+plagioclase+ilmenite+liquid+quartz) indicates a drop in pressure and rise in temperature at P-T conditions of 7.6–7.7 kbar and 878–883 °C; (4) retrogressive amphibolite facies stage, which is represented by amphibole+plagioclase kelyphitic rims around garnet, formed under conditions of <5 kbar and <650 °C. 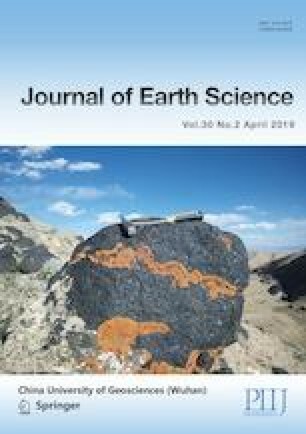 The preservation of medium pressure granulite facies assemblage and the garnet composition feature constrain a following isobaric cooling path during late exhumation. This process suggests a clockwise P-T path and indicates that the granulitized eclogites record a high grade “Barrovian” metamorphic overprint at the middle-lower crust during exhumation. The present data show that the Luliangshan terrane is a “hot” HP-UHP terrane. We are most grateful to two reviewers for critical and constructive reviews for the manuscript. This work was financially supported by the National Natural Science Foundation of China (Nos. 41630207, 41572180) and the China Geological Survey (No. DD20160022). The final publication is available at Springer via https://doi.org/10.1007/s12583-019-0897-6.